There are parallel universes happening right now in Nepal – trekking to base camp, building base camp and putting in the climbing route. Climbers and trekkers are well into their six to eight day journey taking in the sights and having their lives changed as they experience the grace and beauty of the Khumbu. Meanwhile at Everest Base Camp, Sherpas are building tent platforms and preparing their team’s base camp for the next few months. And on the mountain the Icefall Doctors are working hard to put the route in to Camp 2 in the Western Cwm. Word has it they are already past Camp 1. They report the route through the Icefall is “good” but they always say that each year. Let’s wait for the first experienced Sherpa or guide to go through for a report. Nothing big happening yet on the Tibet side as China only opened Tibet to foreigners today. Usually climbers arrive at Base Camp on that side after April 15th, so we have some time. On Annapurna, Nims Purja who is hoping to summit all 14 of the 8000ers in only 7 months has established his base camp. Also, Pakistani mountaineer Ali Sadpara will try his first 8000er outside of Pakistan on Makalu this spring. Finally Adam Bielecki and Felix Berg will try a new route in the northwest of Annapurna. But now it all about the trek. As you step off the plane in Lukla, you begin day one of many where you simply stop in your tracks and stare. The trek to Everest Base Camp (EBC) has begun in earnest. After a simple breakfast at one of the local lodges, you throw on your day pack holding an extra jacket, hat, and gloves plus water and a snack that you won’t eat. The trail is wide and worn – really just simple dirt. As you leave Lukla you are greeted by a series of stupas, chortens and mani stones, all hand built, some decades, perhaps centuries, ago. You remember to always go around them on the left side, the clockwise direction in which the earth and the universe revolve, according to Buddhist doctrine. The trail drops gently downhill. Hmm, you think. Does this mean I have to go uphill at some point, especially on the way back? A curious thought for someone going to climb Mt. Everest! But soon the trail picks back up and winds through a narrow terrain with the Dhudi Kosi River to your left and the ever-higher peaks of the Himalayan on your right. Your destination is the small village of Phakding, about 8km/5-miles away. You get into a comfortable pace knowing you are now around 9,000-feet/2,743-meters. The conversation starts strong but stalls as everyone gets into their own thoughts. Today is not about making good time but getting into the rhythm of the Khumbu. Soon a porter with your duffle bags passes you. Actually, he has three duffle bags on his back – a double load so he’ll make double the money today. This sight will amaze you every time you see it. How young the porters are, their Chinese canvas shoes, how their body seems small and fragile yet the load is so big and the web that drapes around their forehead, a tumpline, that helps carry the load. You promise yourself that you will seek out your porter and give him a tip. The constant roar of the rushing river keeps you company. Today, the sun is out and it feels hot. Now you wish you have followed the lead of the guides who are wearing shorts. Who knew? After about three hours you arrive for your first night on the trek, a small lodge in Phakding. Sitting on the outdoor concrete patio for a moment you feel like you are back home with the plastic chairs and picnic tables but then the loud clanging of bells disturb the moment as several Dzos pass by loaded with more duffles and of course, some hay for themselves. The first-night dinner is a Khumbu standard: Mo Mo’s. You go to bed that night feeling a bit tired, the jet lag is still taking a toll but you are on the trek and taking it all in. Tomorrow is the Namche Hill! Up at 7, you feel more human today. Breakfast is a fried egg, and toast plus coffee. It tastes good. It’s April 2 and the air is still cold, perhaps around freezing this morning so you put your down jacket, gloves, and cap on as you step onto the trail. Today is a big day. You enter Sagarmatha National Park, home of Mount Everest, and sleep tonight in Namche Bazaar. This next section of trail is outside the Park so there are many villages along the way, and one of the most meaningful times is seeing the children of the Khumbu walking to school or just hanging out. They smile so easily, laugh hard and seem happy just playing with sticks. Yet you know their parents want the same thing all parents do, a better life for their children. So they go to school to learn to read and write. Some go on to Kathmandu to boarding school, if their parents can afford it. And this is why they have tea houses, are trekking guides, or even mountain guides on Everest. The trail is steadily up now because you are going from Phakding at 2,610-meters/8,562-feet to 3440-meters/11,286-feet in Namche. The trek should take about six hours, but you know what’s ahead. The trail to Monjo and entering the Sagarmatha National Park is a sensory delight. The kids, colorful buildings, the clanging of bells, prayer flags – yes this is what you were told you would experience and it’s alive, right before your eyes. Passing out writing pens in the Khumbu. I think he/she is happy? Entering the park is easy. But an ever increasing trend in the Khumbu is toll booths. 20 years ago, you paid one fee and that was it, today, it seems every border and village has their hand out. You wonder how much goes to the people or to the bureaucrats in Kathmandu. No matter, you pay and take a very long set of rock steps down towards the Dhudi Kosi. Near the bottom of the steps, you cross yet another swinging bridge adorned with prayer flags. But this time you look behind you. An amazing tree is in full bloom filling the vista with bright purple and white blooms. Its spring in the Himalaya! Continuing by the river, the next sight are two swinging bridges – old and new. And beyond that is the Namche Hill. Now gaining elevation once again you reach the start of the new bridge – it’s a bit higher than the old one. Pausing here one of the Sherpas explains that the old Namche Hill was much worse. He points upriver to a hillside so steep you wonder how trees hold on. Crossing the bridge wakes up any malaise that might have been developing in your body. The wind is strong. The prayer flags flow in the air horizontally as the bridge gently rocks under the weight of its passengers. At the other end, once again you pause to take it all in – the river, the bridge, the mountains, the chill in the air. You are in the Khumbu. Someone on your teams makes a comment “Hey, it’s only another two hours.” You slow down. From now on its one foot in front of the other. Control your breathing. Stay focused. A series of switchbacks define the trail. A few rocky sections and of course dodging Dzos, mules and the occasional horse. 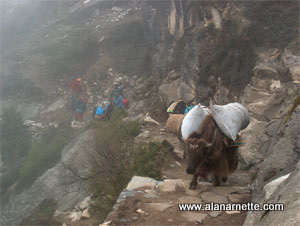 Oh and the ever-present porters hauling trekker and climber’s gear to Namche but also supplies to the next village. At a random spot on the death march, some calls out – “Hey it’s Everest!” You step to the right side of the trail and peep through a clearing in the trees. Sure enough, your first view of Everest in Nepal. It’s huge even from almost 40 miles away. You can easily see the huge, long white plume off the summit – high winds from the jet stream are creating condensation looking like a cloud. Today is definitely not a summit day. The winds are probably close to 321kph/200 mph. Taking advantage of the break, you sit down on a big rock. You are probably not the first person to do this and not the last. You finish up the last liter of water. You knew you should have packed two but the days seemed so short. Another lesson. The team snakes along, steadily gaining altitude when the trails flatten. Ah, finally we’re here, you think only to be tricked when it continues to gain elevation. Step by step, you move along. The conversation is non-existent. What is there to say, “So, do you have a favorite football team?” No, not going to waste your breathe on small talk now. Another corner and now a building. Hmm, another check-point. This is starting to feel like something out of the Cold War. The guides handles it all as you sit heavily on another convenient rock. Your face is covered with salty sweat. You need water. Another few turns and you leave the trees. Then a welcome sight unfolds before your eyes. Namache. Built in a natural amphitheater, Namche Bazaar has grown over time to be the hub of tourism in the Khumbu. Once the home of a few teahouses, today it has bars, hotels, discos, coffee, and gear shops. Basically, you can get your haircut, buy climbing boots or a down sleeping bag, hire a guide, porter, a yak or helicopter – literally anything you would ever want. The dirt streets are lined with rocks to keep the running water behaved. But the occasional Dzo clears the streets and for the first time you see a yak – they are huge, furry and plodding seemingly oblivious to their surroundings. Some are loaded with gear, others are just being moved. They don’t seem to mind – both literally and figuratively. You will see more of these beast as they live above Namche and not lower. Now you do stop and stare. What an oasis. What a community. What a sight. welcome to Namche. Home for the next two days. This is such a spectacular post and series. I really appreciate your writing. We were trekking up near EBC and the 3 passes in May 2018. Thanks Sean! Labor of love! Thanks for the evocative description Alan. As we walked the trail between Tengboche and Pheriche today there was constant Heli traffic in the Khumbu with loads being ferried, many slung below, to EBC. They’ve been out early all week to take advantage of the good weather before the clouds began to fill the valley in mid-afternoon. On to EBC and hopefully the tops of Lobuche East and Island Peak next week! Thanks for the annual coverage. Its like doing it all over again. Great write up Alan.